Convalt Energy is collaborating with WindSea to commercialize the world’s first multi-turbine, semi-submersible wind platform with the goal of implementing it around the globe to deliver clean and cost efficient power. WindSea is a concept for offshore multi turbine wind platforms. The concept is being developed using the accumulated extensive experience of professionals in the offshore industry. 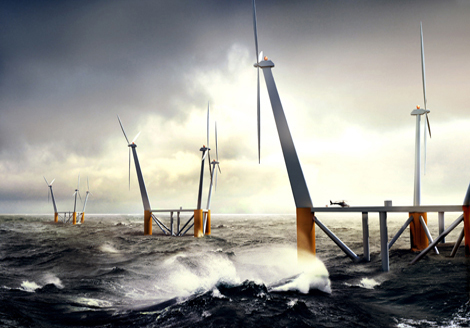 The key issues particular to offshore wind turbine deployment such as fabrication, access, installation, and maintenance are being addressed by the WindSea design is expected to be tested with a prototype in 2015. The configuration of the platform is a semi-submersible vessel with 3 corner columns. Each column supports one wind turbine. The semi-submersible vessel is moored to the sea bottom with the mooring lines connected to a turret at the vessel geometric center. This configuration allows the vessel to rotate. The vessel is therefore always able to orient the turbines optimally towards the incoming wind.